HR departments can focus on their KPO’s when the recruitment function is outsourced. We offer just RPO or a blend of RPO and HRO. We strive to make the tedious process of filling difficult positions in Africa, as easy as possible for our clients. We have pioneered an African solution with methodologies that work, with understanding strict compliance rules in African countries. We can manage the whole process for you, take over your careers page, website and provide you with a solution built for the African environment by helping you to build your own database of local and expat candidates, along with branding and raising your company profile. We assist clients to go over to Regeneration Software Solution (RSS) built on the Koneqt platform to handle the whole recruitment function from an admin point of view. AdoGreen Africa has the expertise to partner with you to take full responsibility for the management of the entire recruitment process on your behalf. From writing job specs, to final on-boarding of a new candidates. Large scale recruitment in Africa done through recruitment process outsourcing enables the client to: - speed up hiring turnaround times while having access to a quality local and expat candidate pool. This will reduce cost, improves compliance, hire at the right salary scales and understand the country and regulations better. On boarding and hr information systems (HRIS) with data entry management. When to consider using Recruitment Process Outsourcing in Africa? When you have a large scale recruitment drive and need to on-board a high volume of applicants quickly. When you are trying to recruit hard to find candidates in a skill shortage environment. When you need either your entire recruitment process to be handled by AdoGreen Recruitment or department as well. 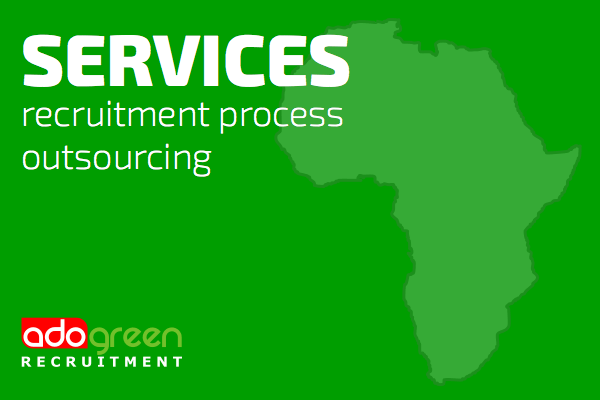 The whole recruitment process is outsourced to AdoGreen Africa. This means the client wants the staff recruitment function to be done by AdoGreen Africa. All recruitment functions are moved and centralised to AdoGreen Africa Recruitment. Minimum of a two year agreement and longer. This is a function offered in addition to RPO if required per client requirements where AdoGreen Africa will also govern the entire Human Resource Function from departmental set to employee relations, Industrial relations and well as contractual requirements for employees. This is particularly effective for start-up companies lacking the initial manpower to recruit with legal compliance in extreme deadlines. This would be a minimum of a two year contractual agreement and longer. Includes everything of the Total Recruitment Process Outsourcing but can be limited to specific positions, and for a limited period of time for a specific project. Typically a company would use this option when they want to establish in a new country or location, or to quickly get a team together for a project. It can be as short as a 6 months period.